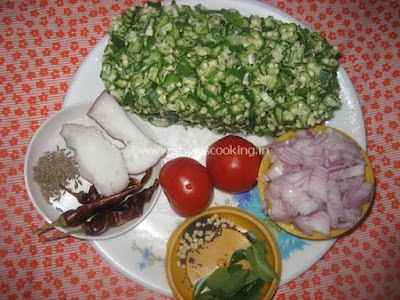 Vendakkai Thakkali Masala - Tomato Bhindi Masala, this dish is a typical South Indian preparation. Actually, the dish is easy to make but we need real patience in cutting the lady's finger. We need to finely chop the lady's finger to make this dish. Adding tomato will give a little tangy taste to the dish. At the same time, adding coconut will give a nice flavor and taste. Hope many of you might have not tried this kind of recipe. Do give it a try! 1. Keep all the ingredients ready for makingVendakkai Thakkali Masala. a. Finely chop the lady's finger / bhindi. Click this link to view the tips to clean and cut the lady's finger / Bhindi. b. Finely chop the onion. 2. Heat oil in a pan, add mustard seeds and urad dal, when the mustard seeds splutter, add the onion and curry leaves and saute till the onion turns transparent. 3. Add the chopped lady's finger,and saute till the stickiness of lady's finger goes off. 4. Add chopped tomatoes and salt. Saute till the tomato become soft. 5. Take a blender and add all the ingredients mentioned under "To Grind" section. Grind to a coarse paste. 6. Add the ground paste to the lady's finger and mix well. Cook on medium flame for about 5 minutes and switch off the flame. Tasty Vendakkai Thakkali Masala - Tomato Bhindi Masala is ready to serve.